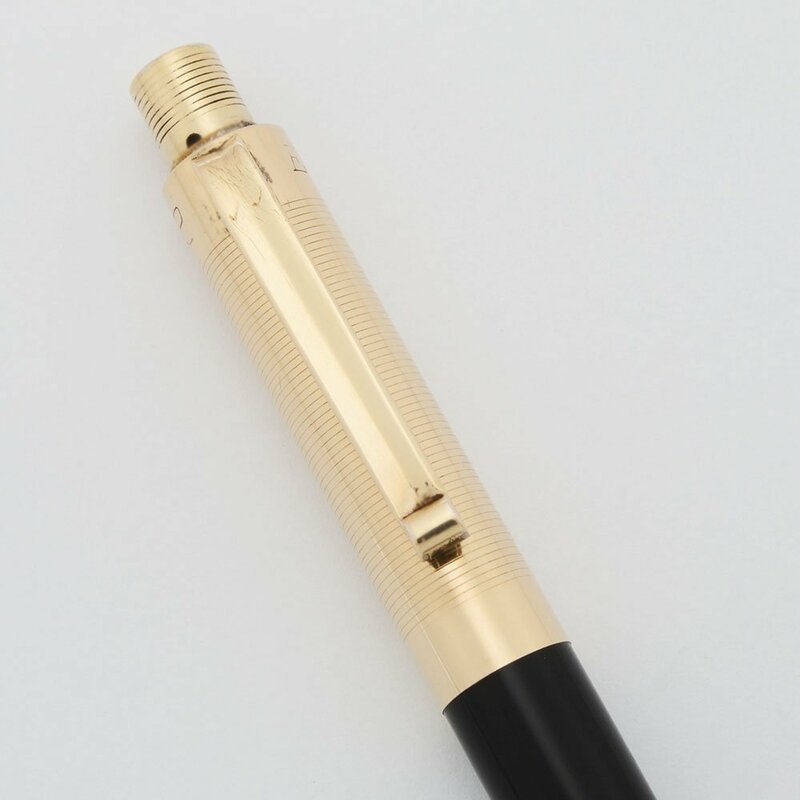 Eversharp Fifth Avenue mechanical pencil in black with gold filled cap and trim. Very nice condition, working well. Filling System Takes 1.1mm (or "Thick") leads, which it extends by the cap-actuated mechanism, where you press the eraser-cap piece down, just like modern day mechanical pencils. We've added a few leads to the internal lead storage area. Color Black barrel, gold filled cap, trim, and cone. The cap is pretty, with horizontal lines on the cap and clicker and an interesting stylized clip. Condition Very nice condition. The black barrel has light to moderate scratching with some heavier scratch marks toward the middle of the barrel. The cap also has some scratching, including a long thin scratch that passes through the E and V of Eversharp. The clip has a little plating wear just above the end piece and there are scratches by the two double check marks at the top. The clicker trim ring has plating wear. The cone has heavy scratching and plating wear. There are no cracks, chips, dings or dents. The imprints are clear.